We have 2 different types of beginner courses, a General Guitar Course and a Classical Guitar/Flamenco Guitar Course. 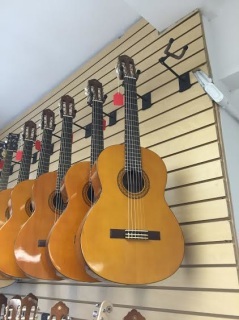 This page features our Classical Guitar and Flamenco Guitar Courses. There is no prerequisite for the classes below. These classes are for students picking up the guitar for the first time. We also offer level 2, 3 and 4 courses for students who want continue or join up already knowing the basics. This course will teach you the basics of Spanish Classical and Flamenco guitar. At the end of this class, you will know how to play 5 right hand techniques: Rasgueo, Picado, Arpeggio, Pulgar and Golpe. Learn to play Spanish Classical songs like Romanza and Flamenco styles such as Rumba, Malagueña and Solea. In 8 weeks you'll be able to play full solo guitar pieces. ​Once you "Buy-Now" you will receive an email to confirm the day/time slot of your choice. Below is the list of start dates for all upcoming classes.